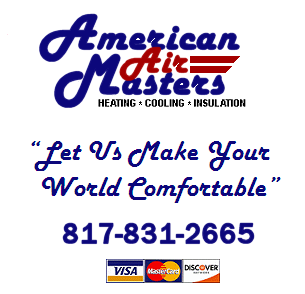 American Air Masters, Inc. specializes in residential air conditioning and heating repairs and new installations. Serving the North Richland Hills, Texas area, we will promptly and professionally be at your service to provide you with the best solutions to your air conditioning and heating needs. We service all makes and models, offer same day service in most cases, and provide a comprehensive preventative maintenance plan. We are also happy to provide custom attic insulation installs using AG Foam Insulation. Please call us for further information regarding attic insulation. For honest, reliable and fast service in North Richland Hills, Texas, call American Air Masters, Inc. today!